Security—independent cylinder locks on each door includes locking state indicator (red/green). Constructed using multiple layers of fire-resistant gypsum and mineral fibre insulation, cabinet body has a rugged powder coated steel exterior that provides excellent corrosion resistance. Under fire conditions, intumescent strips expand and hermetically seal all gaps to reduce heat entering the cabinet, providing 90-minutes of content protection and extended evacuation time. Hybrid style doors open or close manually and include a damper that adjusts the force needed to move the doors. In the event of a fire, the built-in fusible link system releases to allow automatic closure of doors at 122°F (50°C). 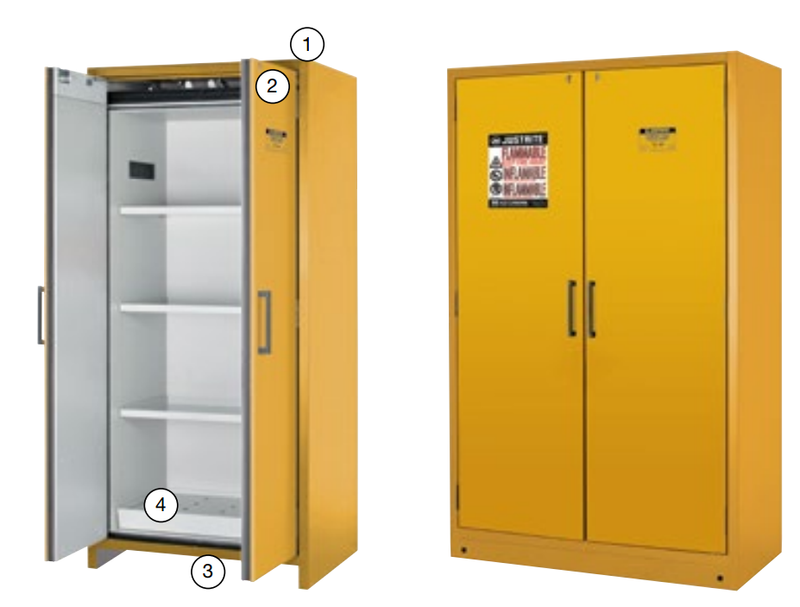 Cabinets are EN compliant, FM-approved and meet NFPA 30, NFPA 1, and OSHA standards. Powder-coat finish steel shelves adjust on 1-1/4-inch (32-mm) increments and have a load capacity of 165-lbs (75-kgs). Shelves with 1-inch (30-mm) high ledge prevent small containers from easily sliding off. Removable bottom sump with detachable perforated insert features a 3-sided lip seal to ensure leaks or spills from shelves are captured at the bottom of the 3-in (76-mm) sump, keeping containers stored in the sump clean and dry. Haz-Alert reflective trilingual warning labels are highly visible under fire conditions or during power outages when illuminated with a flashlight. 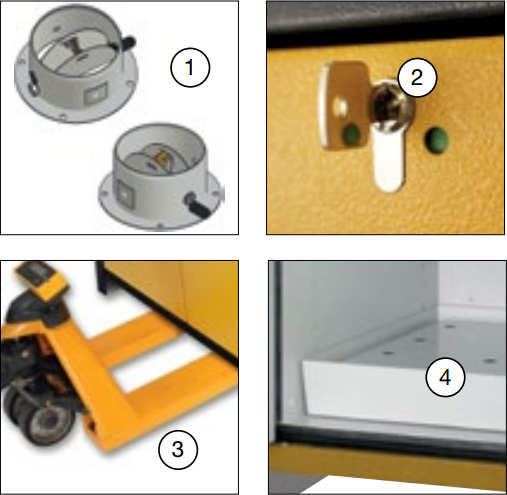 Cabinets also feature adjustable levelling feet, an integrated transport base for easy repositioning (base cover optional), and mandatory air vents per EN 14470-1. Vent butterfly valve closes securely at 158°F (70°C) in the event of a fire. Vents include flame arresters and caps for FM compliance. Two top vents with butterfly valve close automatically at 158 °F (70°C} under fire conditions. Sidewalls inside the cabinet feature upper and lower black air grids with integrated ducts that connect to top vents. Independent cylinder locks on each door includes locking state indicator (red/green). Integrated transport base accepts pallet jack for easy repositioning of empty cabinets. Accepts optional, removable base cover. Removable sump with separate detachable perforated insert allows spills to flow into sump for easy cleaning, and keeps containers elevated to stay clean and dry. Bright interior provides maximum visibility in low light conditions to quickly identify contents.